The keystone oral-pathobiont and one of the major causative organism for CP, Porphyromonas gingivalis (Pg), has been identified with the ability to invade epithelial, fibroblasts and dendritic cells. “Our study was designed with an objective to interrogate the role of Pg and its fimbriae-mediated infection of human retinal-pigment epithelial cells and retro-orbitally injected mice retina, thus revealing possible molecular links between CP and AMD,” said Hyun Hong (Predoctoral dental student, Summer Research Program, Dental College of Georgia) and Dr. Pachiappan Arjunan, the Principal Investigator, who directed this study (Assistant Professor, Department of Periodontics, Dental College of Georgia, Augusta University). Human retinal pigment epithelial cells were infected with Pg and its isogenic mutant strains and genes were analyzed by qPCR. 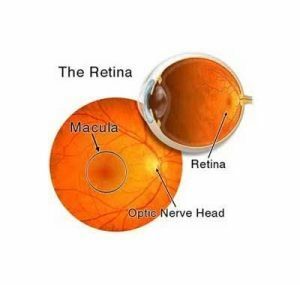 The results showed that human retinal-pigment epithelial cells take up Pg381 and that qPCR shows a significant increase in expression levels of genes, important in immunosuppression and angiogenesis/neo-vascularization markers compared with uninfected control. Certain complement regulatory-related genes were upregulated, while others were downregulated. In a mouse model, AMD-related effects on mouse retinae were induced by Pg-injection compared to control group. Dr. Arjunan states that, “This is the first study to demonstrate the link between oral pathobiont infection and AMD pathogenesis and that Pg can invade human retinal-pigment epithelial cells & elevate AMD-related genes which might be the target molecules for both diseases”. Further, successive ongoing studies in Dr. Arjunan’s laboratory in collaboration with Dr. Christopher W Cutler (Professor and Chair, Department of Periodontics, Dental collage of Georgia, Augusta University), could distinguish specific causal role of Pg in AMD pathogenesis. The first part of this work will be published very soon, he added. This work was funded by the Department of Periodontics, Dental College of Georgia, Augusta University and seeks additional funding support from National Institutes of Health (NIH) to accomplish the objective of this innovative study.